It may seem it is taking me an inordinate amount of time to paint the landscape. As you can see from the photo, there is a lot of ground to cover. As I move closer to the foreground, each slope is receiving more detail and texture. Finally. I have been waiting and waiting until I moved down to the water. Up until now the piece has been mostly monochromatic. A subtle palette has its place but it wasn't what I envisioned for this dramatic landscape. I knew once I painted the water, the background would become more alive. 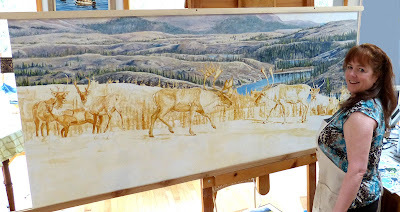 There may still be color shifts and balance issues I'll want to address in the background after the caribou are painted. I won't know until I see how each of their lights and darks work with the landscape. Here I have added more trees to the right side and have started blocking in the nearest right slope. After cleaning my brushes today, I noticed the middle section of water was too visible. Back to the easel and out came the brushes to fill in the trees. Now the main body of water steals most of the attention. If you look carefully, you can see the first bit of water peaking through. This northern Labrador terrain is impressive. Rolling hills, rocky cliffs, lakes, Boreal Forest, and tundra. On one of the days I was here another artist and I spent 11 hours hiking to put us close to a large group of migrating caribou. More about that later when I start painting the caribou. Big country, big landscape. I like starting at the top and working my way down from background to foreground. All the painting is done wet-on-wet, not waiting for layers to dry but rather blending the wet edges. This is not an area where I want sharp lines. The distant background has cool tones and as I move to the foreground I will add more warmth to the scene. Right now I have about 6 brushes which I am using. Flats are my favorites, especially ones with an angled edge. Those work particularly well for a subtle defining of the trees. Even though my easel has been modified to hold the board, I can't paint this upper area sitting down like I usually paint. The top of the painting is still so high I have to reach up to paint certain areas. I am walking back and forth and spending a great deal of time standing back from the painting. On a piece this large, you just can't take it all in unless you are a good distance away. The above may seem an odd title for a post but I'd like to give you a peak into my creative process. So far, I have reworked my drawing two times....after I thought I finished it. 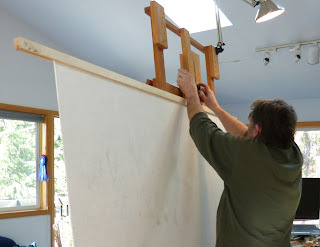 The first time was when I set the board on the vertical easel. I had drawn the piece on a more or less horizontal surface and only by standing on a chair could I attempt to see the whole board. Now that I could stand back from it something about the bigger bull bothered me. Ah, he was a tiny bit too small. As a matter of fact, he was 5% too small! 5% may not seem like much but it was enough to upset the entire balance of the painting. So, out comes the eraser and since the board already had a light wash on it, I grabbed the elbow grease too! Once I drew him larger (a long process) I started on the wash for the caribou on the right side of the painting. That was my last post. My next step was the caribou on the left side and then the bigger bull. One of my favorite caribou was the one I drew in just behind the bigger bull. I oriented him so his legs could be seen in back of the bull. And it was a very good drawing of him. But, there was a problem. As pretty as my drawing, as much time as I spent on it, as much as I loved the animal's expression, he distracted from the bigger bull. He had to go. 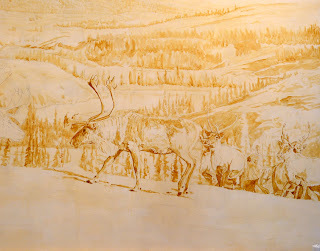 Despite the fact that this caribou was one of the first I chose to include in the painting, he had to go. As an artist sometimes you have to sing your own praises. But I find especially during the creative process humility is a more faithful companion. By quickly admitting I made a mistake and consistently looking for ways to improve the painting (despite how attached I may be to a certain part), I end up with a much better, and more satisfying, result. Tomorrow I start mixing my oil paints and will begin on the background. Stay tuned. Here is the start of my raw sienna - burnt sienna turpentine wash. I find that not only does this seal my pencil drawing and give me a value study of the piece, but it also lends a vibrancy to the painting. Some of this underwash will peak through and the juxtaposition of the "orange" wash with cooler hued oil paints adds a natural excitement. I could use any color for my turpentine wash but I have discovered that this color works with all my nature and wildlife paintings. It is also refreshing to paint on a toned board rather than on white gesso. Below is a detail of my work so far. In order to keep the painting from swinging back and forth and warping, I asked my husband to make slotted stiffening boards. These boards have been screwed to the easel for additional stability. When I finish the background rough-in, I'll want to use my horizontal hand rest system to paint the caribou. The attached stiffening boards are thin enough to accomodate the vertical posts to which my horizontal hand rest is attached. While working on a big landscape like this, I find vertical posts in the center distracting and it is difficult to blend behind them when working wet-on-wet with the oil paint. Lighting is another issue. I am not used to worrying about the amount of light so far away from the center of my easel. So, we are mounting a swing arm on top of the easel on the left and right sides. The right one is on below. 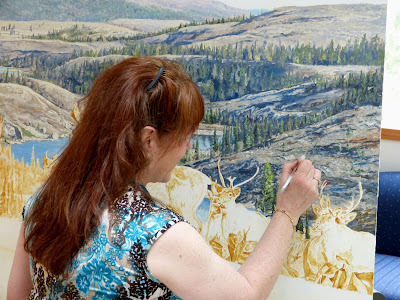 Named the Safari Club International Foundation 2014 Conservation Artist of the Year means that I will be doing a big, yes very big painting for the 2014 Convention in Las Vegas. The subject is caribou, one of my favorite and an animal I have spent time with in the wild. My closest encounter with them was in a remote part of Labrador, Canda. For weeks I have been combing through my reference, thinking, and then revisiting my concept over and over again. By the time I finally worked out my composition, I had reviewed hundreds and hundreds of photos I had taken on that trip and other trips in caribou country and had gone through my various notes. One of my first thoughts was that caribou are known for their impressive migrations. Painting one or two of them seemed to deny them this aspect. 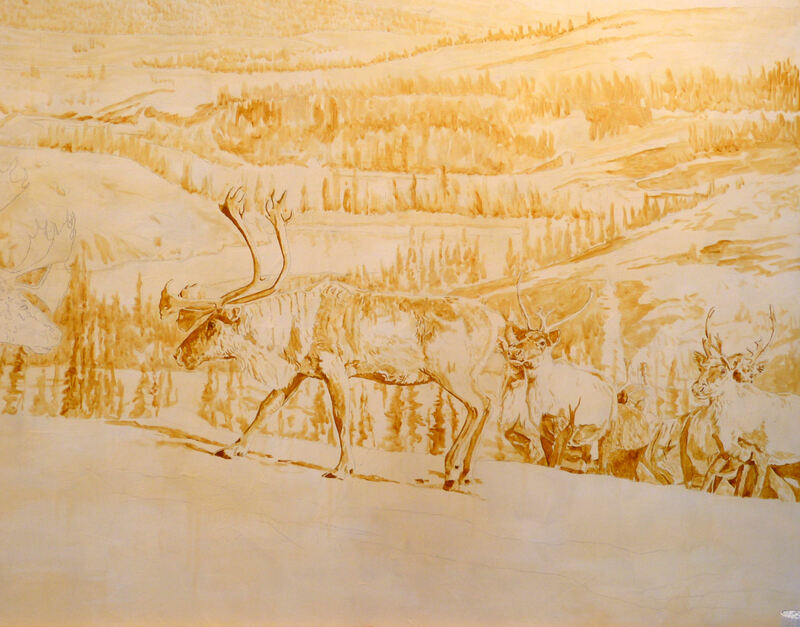 So, #1 - paint a number of caribou. Next, a bunch of caribou without action or pending action could be boring. Caribou live in specatular country. Why not show it off? I'll be referencing dozens of my photos as guides and you can see a few of them below as I work on the drawing. As I sketch, I correct the deficiencies in my photos so I will have accurate anatomical drawings as a basis for my painting. With the composition set (as much as it ever is at this stage), it was time to determine the size. I knew the painting would be big, but why not make it really big! Using the aspect ratio I had determined for the composition, I decided to make the piece 34" X 78". 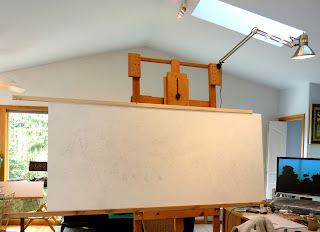 A painting that big will require some modifications to my easel. Stay tuned.